Smoke Tree Jeweler’s goal is to help our customers select jewelry that they will love and cherish for years to come. We want to make picking out jewelry as easy and convenient as possible, which is why we are pleased to offer not only separate engagement rings or bands, but wedding ring sets, as well. Once you have found an amazing engagement ring, you will need a wedding band that fits perfectly with it. No need to look any further! 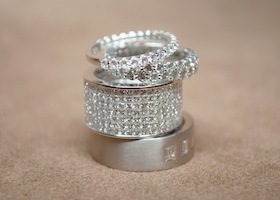 Our variety of beautiful wedding ring sets is high quality and top-notch that will catch everyone’s eye! If you want a unique wedding ring set that will last forever and make an impression, look into Smoke Tree Jewelers exquisite collection today! We know how exhausting searching for the best wedding ring set, which is why we offer an alluring collection to choose from. Don’t waste anymore valuable time and come into Smoke Tree Jewelers today! Our experts will help you find the perfect wedding ring set.